SERVING DELICIOUS food on the Boulevard for a quarter of a century are Dimitri and Thomas Houndalas. 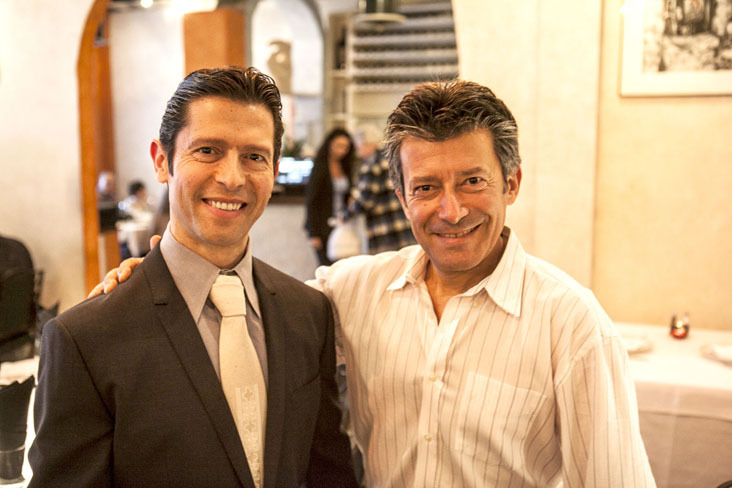 Le Petit Greek co-owners and brothers Dimitri and Thomas Houndalas have spent the past 25 years serving grilled rack of lamb, bechamel-topped moussaka and a cold glass of retsina. Also on the menu at the 100-seat Village staple is hormone-free, “grass-finished” beef. The seasonal menu is part of a larger “Hellenic” experience that expands beyond food, delicious as it is. “It’s part of our culture, a healthy mind, a healthy body. That’s what our ancestors taught us,” says Dimitri. Up before sunrise, he shops for fresh produce, meat and fish in time to be back to greet the lunch crowd. The brothers celebrate 25 years on the boulevard Mon., May 26. Since opening, Le Petit Greek has doubled in size spilling outside to a welcoming patio. Dimitri estimates 80 percent of his customers are regulars. He is especially touched when the children of his earliest customers, now adults, bring in their children to celebrate birthdays, graduations and other milestones. The brothers grew up in a small town in the Peloponnese, where, like Larchmont Village, everyone knows everyone. Thomas spends part of the year running the pair’s boutique hotel on the island of Santorini in Greece. Dimitri’s lifelong interest in nutrition and exercise is being channeled into a blog he writes to educate people about the foods we eat. Unless a label reads “grass finished” the animal was fattened with grain the last few months of its life, robbing most of the vitamins and good fats, he explains. Atlantic salmon lives immobilized in tight containers and dyed. Eggs labeled organic, or cage free, probably came from hens raised in cramped quarters fed an artificial, albeit organic, diet. Dimitri picks up “pasture-raised” eggs from foraging birds, who eat worms and all “nature intended,” from Gama Farms at the Larchmont Farmers Market. Organic salmon on the menu hails from the Scottish Isles and Norway. Wines are chosen from around the world to pair with dishes on the menu. Thomas studied hotel management and business and worked as a maitre d at the Jonathan Club downtown before opening the restaurant. A classically trained guitarist, Dimitri soon followed his brother to the states. He takes his son, Nicholas, 12, on shopping expeditions to teach him about the business and about life. “It takes a lot of energy and smarts to be successful… and it takes more effort to maintain it,” Dimitri notes. His grandfather, who immigrated in the late 1880s to San Francisco, ran a restaurant, as did his father. Thomas continues to be head chef, but much of the key to the delicious food and rave Yelp reviews is in the quality of the ingredients. And, in the warm Mediterranean ambiance that envelops you. “Unless you love what you do you can’t last this long,” Dimitri says as some of his 40-member staff prep tables for lunch. “It’s been a great ride,” he says, adding he sees another 20, 25 years ahead. Diners will have many chances to win a free dinner for two on the 25th anniversary Mon., May 26. Le Petit Greek, 127 N. Larchmont Blvd., 323-464-5160, lepetitgreek.com. Open daily, 11 a.m. to 11 p.m.